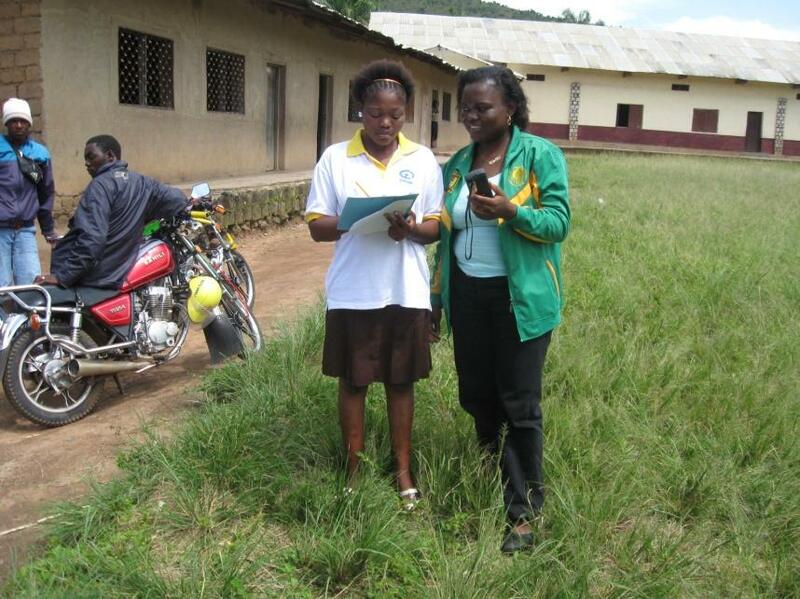 Digital mapping, information and local development in Cameroon | Wait... What? Ernest training youth in Okola. In Garoua, Cameroon last week at a Training of Trainers meeting for the Youth Empowerment through Arts and Media (YETAM) Project, Ernest Kunbega Gwanvoma from GIMAC (Geographic Information and Management Center) took us through the youth digital mapping process that he and Plan staff and other partners facilitated this past year. Ernest’s presentation is posted below (with his permission), along with some comments from the rest of the group. In line with YETAM’s emphasis on use of new technology in youth and community development work, Plan introduced the use of GPS and digital mapping. Training the youths in the use of GPS and digital mapping permitted them to map out their council areas and create an information system, including the road network and other socio-economic infrastructure of their area. This exercise exposed the youths to the realities of their environment, for it took them to all the nooks and corners of their area. This way they could easily identify the problems of their communities and share with their peers all over the world. And what better way than to indicate all this than on a map? Eventually the digital maps produced will be used to track cases of violence, gender discrimination and community development planning issues. They will be used locally and shared on Open Street Map to a wider world community. The general objective of the exercise was to produce digital maps for 3 council areas; Ndop, Pitoa and Okola, where YETAM projects are being implemented. 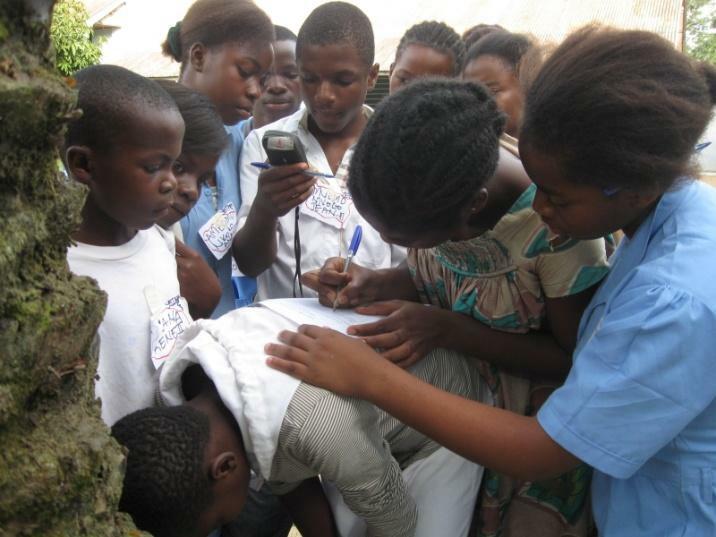 To accomplish this, participating youth were trained on the use of GPS for field data collection. They created way points of socio-economic infrastructures for their areas. A data base on all the socioeconomic infrastructures mentioned above was created. The youth also tracked the road network of their council and put it on the digital maps. This information was all uploaded into Open Street Map. Training youth to use way point forms. During the theoretical sessions, the youth worked in small groups to brainstorm the data that they wanted to collect about their communities. Community members and Plan staff with experience in data collection, advocacy, research and development programs gave input as well. A final set of data to collect was agreed upon, including schools and health centres in all 3 council areas. Each group (from Ndop, Pitoa and Okola) also had its own particular aspects that it wanted to map out, based on local context. In each locality, the start off was at the District officer’s office where a cover letter or letter of introduction explaining the rationale for the field exercise was collected. This letter was presented in the communities as the need arose to avoid any form of embarrassment from the community. The data collection exercise in was carried out by community youths, students, resource persons and the consultant’s team. In Ndop and Okola, the Partner Vision (PAVIS) and IRONDEL staff (respectively) and all resource persons were involved in the data collection. 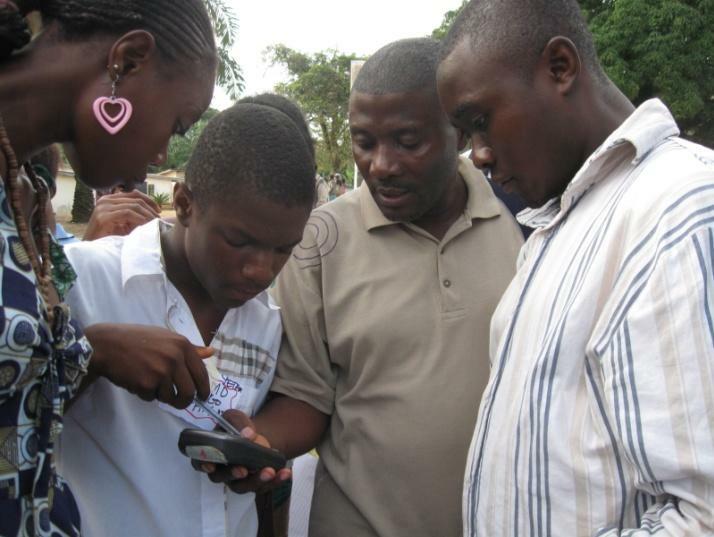 The student youth population was not available due to classes, so the out-of-school community youth who were involved in the training did the data collection. In Pitoa the staff of Solutions Technologiques Alternatives (STA) and all the resource persons were involved in the data collection. The community youths and the student population participated intensely in the exercise for they had just finished with their examinations and their principal gave them permission to participate in the field exercise during school period. To facilitate field data collection in each of the council areas, field groups were created, headed by a resource person or a staff of the consultant. The groups were allocated an area of work. One group was in-charge of tracking all the road networks and the rest of the groups collected waypoints and data on socio-economic infrastructures. In places where the information sheet (data collecting forms) could not be filled instantly, the forms were dropped off to be filled by the competent authorities and to be collected later, this was the case especially with schools. Cars and motor bikes were hired to transport data collectors to the field in each locality. At the end of each day, a review of the day was done; problems, lapses and wrongly collected information were pointed to the different groups for corrective measures to be taken. 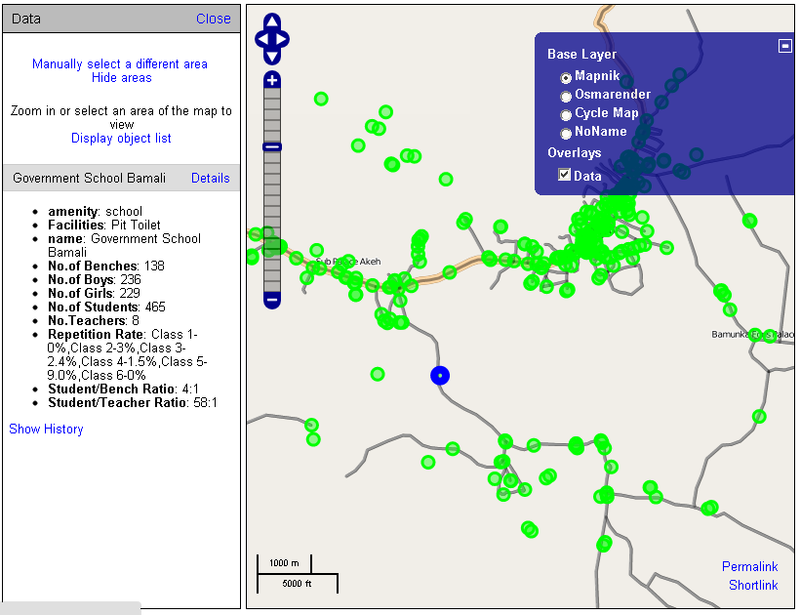 Based on the field data collected attribute tables were built for schools and hospitals etc. The data collected on schools and other aspects were triangulated for accuracy (when possible) with data previously collected by Plan or available from local government offices. 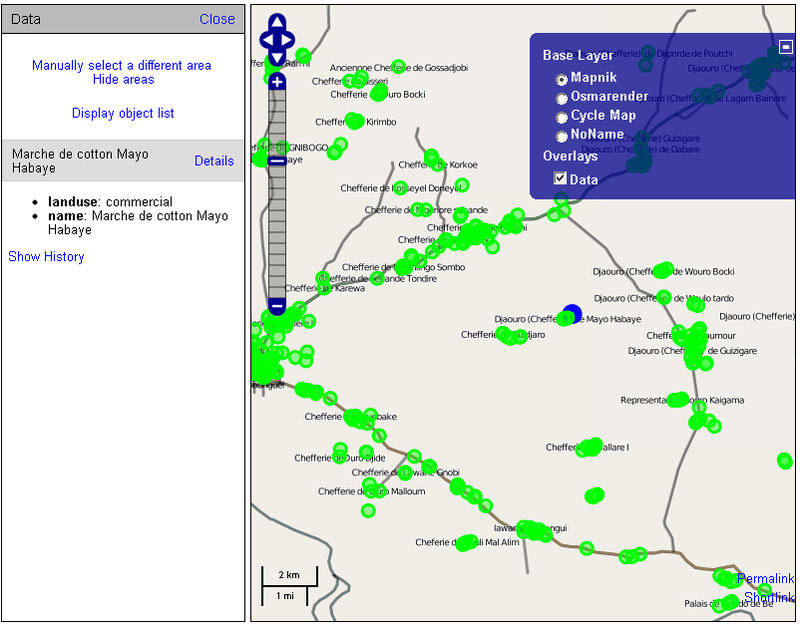 To produce the digital maps of the three council areas the JOSM offline editor was used. The waypoints and tracks were loaded into JOSM. The waypoints were digitized and appropriate attribute information assigned to them as tags. 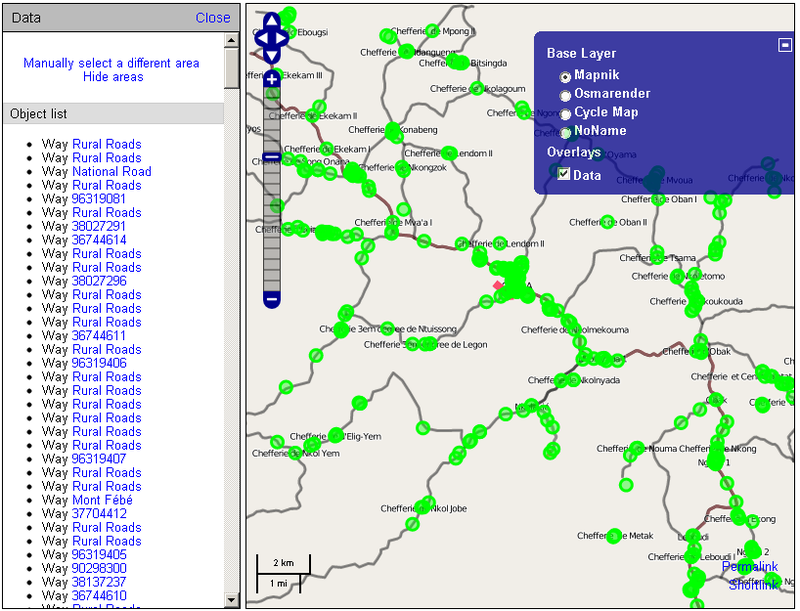 The tracks representing the road network were also digitized using JOSM. The produced maps were uploaded using JOSM to the Open Street Map site with online connection as soon as they were finished. The maps can be seen at the Open Street Map site. 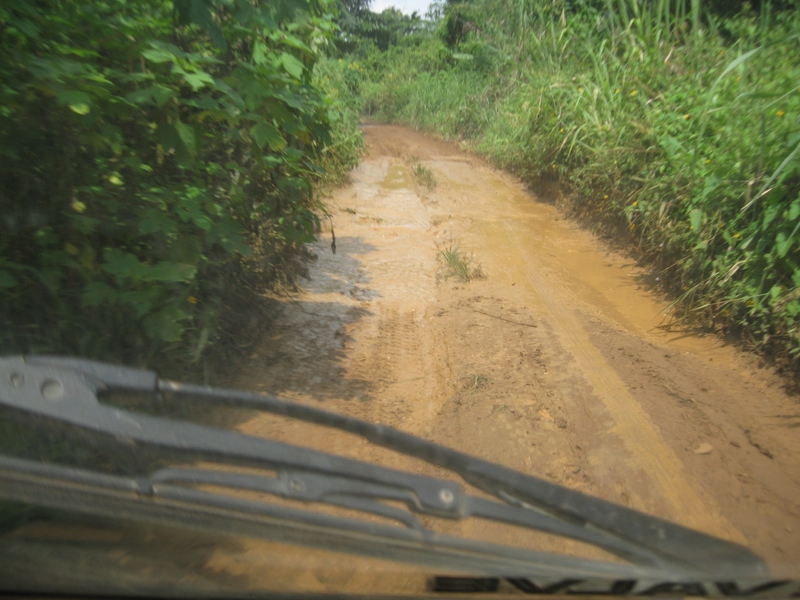 Bad roads made the mapping difficult in areas where vehicles and motorbikes couldn't pass after a certain point. The student population was not fully involved in the actual field data collection in some communities because they had to be in class, so we worked only with the out-of-school youth population. In Ndop and Okola, rain disrupted field activities and work had to slow down given the bad nature of the roads, which became very impracticable to vehicles and bikes, making the whole exercise difficult, strenous and time-consuming. It was not always easy to arrange for transportation. Most of the students and drivers did not know their full community areas well, so local community guides were recruited to take teams around. In some of the areas the data sheets of schools could not be filled because the head teachers were not available. In one particular area, a head teacher deliberately refused to fill the forms demanding bribe from the youths. In some of the schools the head teachers had no information about the student enrolment and as such the youths had to go to each class and count the students themselves which was time-consuming. 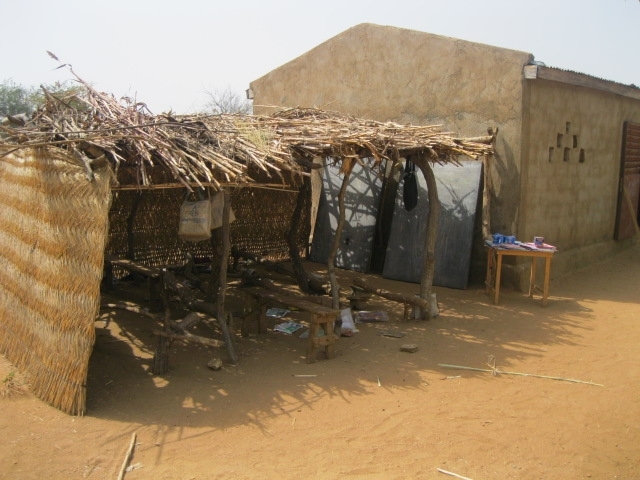 Youths had to trek long distances in some of the inaccessible villages by vehicles because roads were very narrow. Open Street Map image of Ndop with data layer turned on. Data to the left belongs to the blue dot near the center of the map. Pitoa Council Area with data layer. (Visit Open Street Map for interactive view). Okola Council Area with data points. (See Open Street Map for interactive map). The group at the workshop (PAVIS, IRONDEL and STA partners, Plan staff and Ernest himself) concluded that digital mapping was a good exercise. 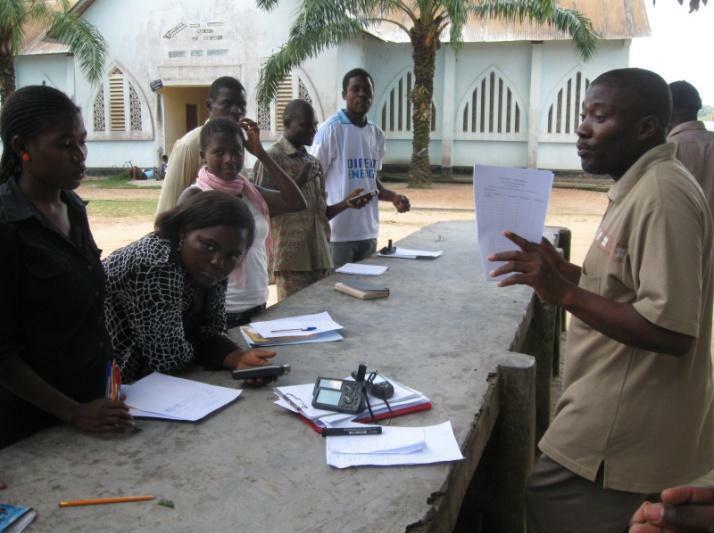 One participant commented that the heads of the school hadn’t been aware of the importance of collecting data about their own schools, and the mapping exercise motivated the youth and the head teachers to begin to collect and track data, to look at the status of their building structures and to count their students. Others commented that the mapping exercise is a tool that really takes the youth around to their environment. 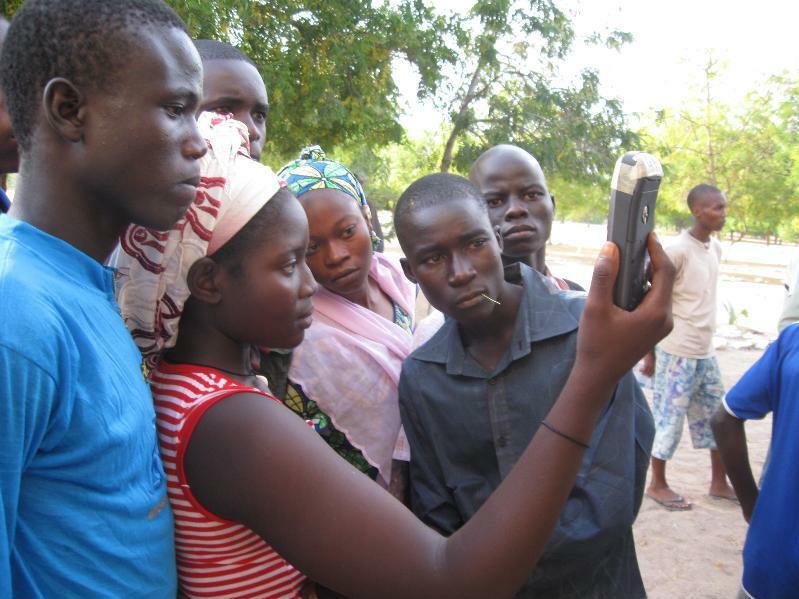 Many of the youth only knew specific parts of their communities, but the digital mapping exercise brought them around to the entire expanse of their community. It gave them a reason and an opportunity to get to know the realities of their environment. The group agreed that in the future, it would be advisable for hand-drawn mapping followed by digital mapping to take place as the very first step of the project, before other project activities (arts, media and advocacy efforts) happen, because the mapping provides the youth with a deeper awareness of their communities and the main issues therein. It also allows them to collect solid data as well as a visual tool that they can use to then carry out their advocacy activities with local councils. (Note: This year, hand drawn mapping was done as a first step, then the arts and media activities followed. Because it was a new activity requiring additional training and preparation for staff and partners, the digital mapping was done in as third step). One question the group will explore is how to train and support the local councils (who have responsibility for decentralized community development in Cameroon) with IT equipment so that they can keep the maps updated and/or create new digital maps on their own. These same maps will serve as a base for an additional phase of the project that will involve tracking and mapping cases of violence against children and gender based violence and working with local communities and local government social services to raise awareness about violence and to prevent and respond to cases of abuse. (Similar to the VAC Benin project). Did the students do the map editing too? This is too much fun and I like this. I’m looking forward to soon taking part actively in mapping our local communities.